The best known of Hitchcock’s British films, this civilized spy yarn follows the escapades of Richard Hannay (Robert Donat), who stumbles into a conspiracy that involves him in a hectic chase across the Scottish moors - a chase in which he is both the pursuer and the pursued. Adapted from John Buchan’s novel, this classic Hitchcock “wrong man” thriller encapsulates themes that anticipate the director’s biggest American films (especially North by Northwest), and is a standout among his early works. DVD: Standard 1.33:1; audio English Digital Mono; subtitles Spanish, Japanese, Chinese; single side - single layer; rated NR; 86 min. ; $14.99; street date 8/4/98. Supplements: An introduction by Tony Curtis; North By Northwest Theatrical Trailer. Slowly but surely I wind my way through the works of Alfred Hitchcock on DVD, and I must say it's been a fun trip. I possessed only a rudimentary knowledge of his works prior to my acquisition of a DVD player, but now I know a little more; I remain no expert, but I've come a long way over the last couple of years. Most of my screenings focussed on his later works. The only exception so far had been 1940's Rebecca, and the only reason I went for that film is because it won Best Picture; I'm trying to review all of the Oscar-winning movies on DVD, so I chose that one a few months ago. 1935's The 39 Steps came my way for a different reason: it was really cheap. I saw a copy of it on sale for only $6 and it pushed me "over the top" so I could use a coupon to get it and something else - that sealed the deal! I didn't really care about 39 but for so little money, it deserved a shot. It doesn't greatly surprise me that I enjoyed the film, as I have liked most of Hitchcock's work, but I felt a little surprised that I found it to be as interesting as it was. 39 is a suspense movie that resembles much of his later work but it stands well on its own and makes for a crisp and tense affair. The plot swerves into a lot of various complications but it largely revolves around the standard "man wrongly accused of murder who high-tails it until he can find proof of his evidence". (Yes, this confirms my worst fears: the plot of Double Jeopardy wasn't original after all!) While the basic story was bland even when this film appeared, Hitchcock manages to provide enough twists and turns to make the movie more than worthwhile. The film integrates the surprises nicely, and I especially liked the wonderful way Hitchcock fits humor into the mix. None of the lighter bits seemed gratuitous or forced, and he had the audacity to blend funny pieces in right along with the tense parts; you'll laugh and still feel tense all at the same time. Not many directors could get away with this, but the device works nicely here. The acting seemed good overall, with Robert Donat's turn as Richard Hanna dominating the film. At first, I thought he appeared rather stiff and flat, but he grows as the movie progresses and is much more suave and self-assured by the end. This follows the character's arc in a convincing manner; Donat really seems to come into his own during a wonderful political rally scene and continues on that path for the remainder of the movie. While The 39 Steps doesn't rank as Hitchcock's best work, it nonetheless provides a very taut and entertaining thriller. He created a piece that conjures its drama along with liberal helpings of humor and style. Even after 65 years, the film holds up very well and remains a strong picture. 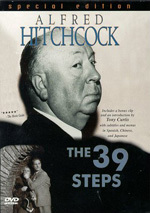 The 39 Steps appears in its original theatrical aspect ratio of approximately 1.33:1 on this single-sided, single-layered DVD; due to those dimensions, the image has not been enhanced for 16X9 televisions. Although not wholly unwatchable, the film looks pretty bad overall and presents a significant number of concerns. Sharpness usually seems weak. Although some scenes display adequate definition, gentle softness and fuzziness marks most of the movie; at its best, it appears moderately accurate, but at its worst, it looks very soft and flat. At least this means moiré effects and jagged edges don't cause any problems, since the softness eradicates any possibility of those issues. However, print flaws are a major concern. I couldn't see any grain, but that stemmed from the softness combined with all the other issues; the print exhibited white speckles almost constantly, and it also showed many instances of grit, scratches, blotches, spots and hairs. A few tears occur, and at least one of them was extremely large; it ran right down the middle of the frame. During some bright outdoor scenes, I also saw some odd horizontal lines in the light portion of the image; these appeared to be some sort of strange artifact but I honestly can't define what exactly they were. Black levels tend slightly toward the gray side but generally look fairly accurate and deep; although the picture as a whole often seems excessively bright, somehow the dark tones don't usually look washed out or faded. Despite the overly-white tone of many of the scenes, the problem goes in the opposite direction for some night-time segments, which offer extremely poor shadow detail. During the scenes with average light levels, shadow detail looks adequate, but once the night comes, the picture becomes terribly dense. Overall, even if one considers the advanced age of this film, the image seems very substandard. Similar problems affect the monaural soundtrack of The 39 Steps. Of all the components, music probably works the best. Films of the era didn't utilize scores to the same extent modern movies do, so we don't hear very much music. When the tunes play, they seem fairly thin and somewhat strident but are relatively clear and concise, with a modicum of bass as well. Effects appear similarly wan and flat but manage acceptable tones. Dialogue offers the most concerns. Speech usually seems sibilant and edgy, with much of it rendered difficult to understand. That aspect is complicated by all of the accents we find in the movie, but the poor quality of the dialogue made the voices even tougher to comprehend. The movie also suffers from a consistently loud and distracting layer of background noise. For the era, the soundtrack of The 39 Steps doesn't sound completely atrocious, but it seems below average and generally weak. Also poor are the supplemental features found on this DVD. We get an odd introduction from Tony "I Really Need the Money" Curtis that lasts a few minutes. Sporting a bad hairpiece of Shatnerian proportions, Curtis offers some general facts about Hitchcock's career, though he doesn't tell us too much about 39 itself. Curtis reads his lines poorly and delivers the m oddly. He also returns for another strange but shorter piece to conclude the film. Who thinks up this stuff? Finally, the DVD also includes a trailer. Strangely, it's not for 39; instead, it's a promo for Hitchcock's North By Northwest, a film for which Laserlight doesn't even hold the rights. What a weird little package! Since this version of 39 only lists for $14.95, I probably shouldn't be too hard on the extras - or lack thereof - but since the producers of the DVD tout it as a "special edition", I feel any bashing is completely justified. This release of The 39 Steps isn't the worst DVD I've seen, but it's up there; from the extremely weak picture and sound to the almost non-existent supplements, the disc flops on virtually all levels. That's too bad, as 39 offers some very good early work from Hitchcock; the film doesn't live up to the great productions he'd release in later years, but it seems quite entertaining and thrilling nonetheless. If you just want to own the movie and don't care so much about the quality, the Laserlight release of The 39 Steps may be acceptable, as it's quite inexpensive, but anyone who wants to have a well-produced copy might be better served by the Criterion edition; I haven't seen it myself but it sounds as though it clearly outdoes this one in all areas.